On Thursday, 7 October, I flew my first cross-country flight from Manassas (HEF) to Charlottesville (CHO) with my CFI. The FAA requires 3 hours of cross country time--flights of at least 50 nautical miles out and then back--with an instructor for the Private Pilot certificate. I will make this trip again, solo, hopefully in the next week or so. Having spent two hours Wednesday morning doing the flight planning with my instructor, I had everything ready to go except all of the calculations that are dependent on the current weather (winds aloft, density altitude). I am not yet very proficient with the E6B, a circular slide rule used to compute wind correction, fuel burn, and distance-speed-time problems, so it took a while to finish the flight plan. I'll get plenty of practice with it over the next few weeks, though. I tried using an E6B application for my Android phone, but it crashed several times during my attempt, thus proving that the slide rule is more reliable. Seriously, why would a glorified calculator application crash? Not a lot going on there. The weather was great, if a little bumpy. We flew the outbound leg using pilotage and dead reckoning. 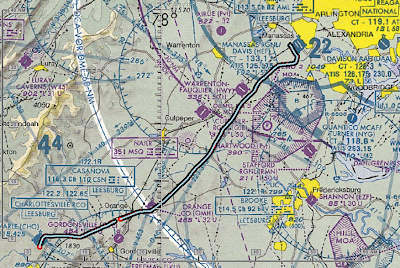 The route took us to Orange County Airport (OMH), over Barboursville, and finally into Charlottesville. We were able to get flight following from Potomac Approach, and I had my first interaction with Flight Service en-route to open my search-and-rescue flight plan. My landing on runway 21 at Charlottesville was one of the best so far, and my computed flight time was accurate to 1-2 minutes. We taxied to Landmark Aviation, parked, and had 7 gallons of 100LL AvGas put into the airplane to avoid paying a landing/ramp fee. There is an airline on the field and plenty of business jets. We took off shortly after I paid the fuel bill. A Dash 8 landed while we were waiting for takeoff clearance. We watched where it touched down and then made the takeoff rotation past that point to avoid any wake turbulence. We departed on the downwind leg and turned for the WITTO intersection. The return route was intended to be flown with the hood on, had I remembered it, as it required tracking a radial all the way back to the Casanova VOR. This was a fun trip. While I was busy looking for checkpoints and flying the airplane (no autopilot or GPS on board), I enjoyed having a few moments to look at the scenery. It was great to actually go someplace other than the practice area.